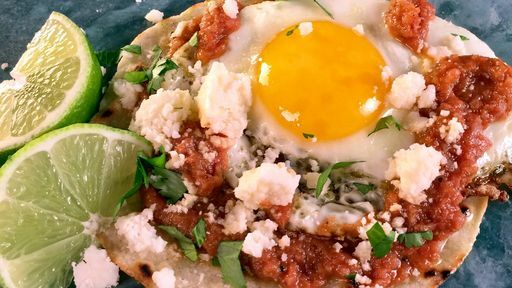 Huevos Rancheros you could whip up in minutes! In a large saute pan over medium-high heat, warm 1 tablespoon of olive oil. Add the onions and chipotle peppers and cook until soft and translucent, about 2-3 minutes. Stir in the tomatoes, season with salt and pepper and cook for 5-7 minutes. Remove to a food processor, fitted with a blade attachment, add lime juice, and puree until smooth. Return the salsa to the pan, reduce the heat to low keep warm until ready to use. Dip corn tortillas one at a time into olive oil, coating each side, and season with salt. Arrange tortillas in one even layer on a baking sheet and place on the center rack of the oven, baking until golden brown and crispy, about 5-6 minutes. Remove from the oven and set aside until ready to assemble. In a medium saute pan over medium-high heat, add 1 tablespoon of olive oil, and pinto beans. Using a potato masher, mash the beans until mostly smooth and broken down. Stir in the water. Add butter, stirring to combine. Continue to cook until warmed through, about 2-3 minutes. Season with salt and pepper to taste and set aside until ready to assemble. In a large nonstick saute pan over medium-high heat, add the remaining 2 tablespoons of olive oil. Add eggs, 4 at a time, to the oil and fry until whites have set and yolks are still runny, about 2-3 minutes. Remove to a plate, season with salt and pepper, and repeat process with remaining eggs. To Assemble: Spread a 1/4 cup of pinto bean mash onto a corn tortilla. Spoon about 1/4 cup of the salsa on top of the bean puree and top with 1 egg. Garnish with cotija cheese and cilantro. Repeat with remaining ingredients and serve. Tip: Cut any remaining tortillas into chip-sized squares, bake, and use to dip into any remaining salsa!